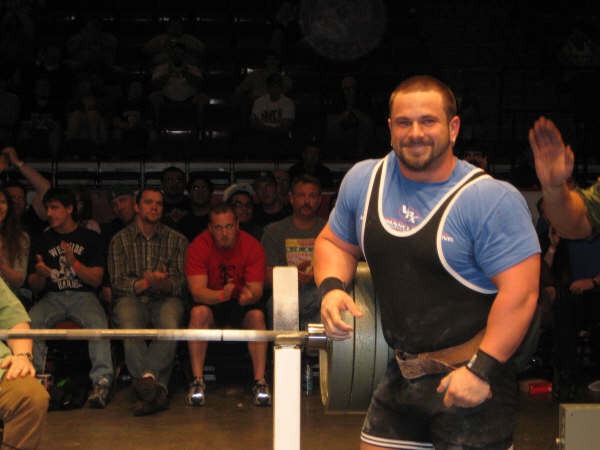 Ever since I broke Mike McDonald’s all-time bench press record back in 2006 with 605 lbs, I get asked just about weekly how I stay motivated, what drives me, and how I keep pushing through knowing that I had the world record in my weight classes. There are a few things that I use for myself, but when it comes down to it, it is the desire to better one’s self. When you lose that, you lose more than just a bench record – you lose the possibility of becoming more than you were yesterday. It’s hard for me to grasp how that can entangle someone and lead them to a path of self destruction or a downward spiral to less than they were previously, but I know that certain things in life can persuade some people to slip into this rut. However, if you desire and are willing to do what it takes to be a better spouse, a better parent, and a better worker, becoming a better bencher will be a piece of cake; it’s the other aspects in our lives that are not only more important, but fuel the fun things and the hobbies we do like lifting weights. The less stress in your life you have, the better you will perform in all aspects of it. To stay motivated, some people need crazy loud music blasting, but what if that’s not available? I know it helps, but what if it isn’t an option? I’m a generally laid-back guy, so the option of using anger to fuel my workouts is harder. Sometimes I can try to convince myself that something pissed me off, but that’s short-lived at best. One of the most motivating things to aid in inspiration is someone telling you that you can’t. Trust me, I have heard that from so many people over and over and still do today. “Jeremy will never bench 700, he’s too light.” “Jeremy can’t do full power as he focuses on bench too much.” But, the important question to answer here is what happens when you do succeed? Does that drive of proving someone wrong fade? Why were you working so hard to prove something to someone else in the first place? So here are a few things about me that have pushed me and push me still today to keep going – not only to keep my bench up and maintain my records, but to better myself daily, avoiding stagnation at all costs. Since I was a kid, I have always wanted to be big and strong like the bodybuilders and strongmen I saw on television. I don’t know if it was the He-Man or Superman fixation or just the physical appearance and ability to do what others couldn’t that caught my attention, but I wanted it. I started lifting in middle school with my father at the fire department where he worked. I was a little heavier as a kid despite being in sports my whole life. Two consecutive broken left legs (three days apart from each other) made me less active for approximately a year. After that was a hard game of catch-up, but as a fourth-grader, drive isn’t quite as strong yet and aid from an outside source like coaches or parents is almost a must. When I got into high school, I found my inner drive. When I started on the weight lifting team, it came insanely easy to me. I had always swam, done triathlons, played football, baseball, and soccer, so the endurance and sense of team was there; however, weightlifting – although it’s a team sport with total points – is based on individual goals and breaking personal records. I had always been good at sports, but I thought then that I had found what I was great at and I wanted to exploit it. A divergent road ahead leading to bodybuilding and strongman shows ended up showing me that powerlifting was the path I should take. While I was training for a bodybuilding show at Florida State University, a guy in my gym told me I had just done a world record for a double. He suggested I try powerlifting, but I was unaware that a powerlifter could be lean (and not 400 lbs., as I had seen on TV). I did one show, and the motivation shot through the roof. I was tired of hearing that there is always someone bigger, faster, and stronger. Why can’t that strongest and biggest person be me? I decided then that it would be. I have just a couple of motivating thoughts I remind myself of each day – in everyday life and in the gym. Like I said, the drive and motivation is in you. What you use to pull it out is a personal preference, but you must know how to go about doing it and to what extent. That is what gets me in the gym sometimes late at night, alone, and during the middle of summer. Leaders pave their own way –usually alone – and take the path less traveled. Sometimes people follow, but if it were easy, everyone would do it. To be in first, you must train like you’re second. I reach out to heavier weight classes and look to the overall bench record; I want them. The second and most influential motivational push I look to is my family. They’re my support system. They are sacrificing while I train or are also training themselves. They are the ones I want to be proud of me. I want my wife to post online how proud she is of another record I broke or for my son to brag at school how I’m the strongest. My daughter is young, and aside from training to intimidate the living hell out of her future boyfriends, I want her to see not only what it took to get to where I am, but respect me for the dedication I put forth to achieve that. There is nothing better than to see my son at 9 years old competing and earning his first medal and hear him cheering when I get mine. My wife is at all of my meets and can be heard on every video screaming for me, wanting the most for me as she knows what it took. Sometimes everything falls into place; you may have a gym that cranks loud rock, full of the strongest powerlifters in the world all together, the best and newest equipment, whatever someone needs, but sometimes you have to find a way to make it happen when it’s hard. Either way, better yourself, make the workout worth you and your family’s time, or you’re just wasting it. The day you sit and do nothing, your competition has the best workout of their lives, and that’s ground that cannot be made up.